STACK Infrastructure, the new data center company that combines facilities from Infomart Data Centers and IPI Partners, unveiled its newly established platform and strategy for rapidly scaling enterprises and hyperscale companies. STACK, which is underwritten by IPI Partners, combines existing operating data centers in six U.S. markets with significant expansion and development capacity. The company’s offering includes hyperscale campuses and build-to-suit data centers, immediately available wholesale colocation and private data suites, and powered shell options. STACK also owns development parcels in Atlanta, Chicago, Dallas/Fort Worth, Portland, and Silicon Valley available for additional future development, including data center campuses and build-to-suits. In addition, the Company will continue to expand in existing and new markets in the future to meet the growing demands of clients. Infomart Data Centers confirmed the sale of three of its data centers and its management company to IPI Data Center Partners Management. Financial terms were not disclosed. The deal includes Infomart’s data centers in San Jose, California; Hillsboro, Oregon; and Ashburn, Virginia. Combined, the three data centers total 665,000 square feet with 27.2 megawatts of total in-place capacity and 29.7 megawatts of additional expansion potential. Equinix has agreed to acquire the Infomart Dallas data center, including its operations and tenants, from ASB Real Estate Investments for $800 million. 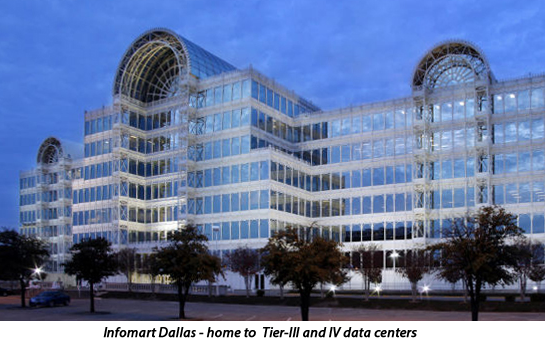 The iconic Infomart building, which is located at 1950 N. Stemmons Freeway in Dallas, is one of the largest interconnection hubs in the U.S. and one of the largest buildings in Texas at 1.6 million square feet (147,094.2 m2) over 7 floors.Infomart is currently home to four of eight Equinix Dallas International Business Exchange (IBX) data centers (DA1, DA2, DA3 and DA6), which combined, support approximately 3,500 built out cabinets.